George Rodrigue (1944-2013) broke new ground when he examined Louisiana with an intense artistic eye. It was the late 1960s when he first contrasted the dramatic visual changes on the journey between his hometown of New Iberia, Louisiana and his art school in Los Angeles, California. He observed that Texas’s expansive sky transitions to Louisiana’s small horizon line, visible at a distance beneath the trees. Simultaneously, Rodrigue sought a symbol— something that would enable him to capture Louisiana in a contemporary way. He found the answer within the oak tree, a strong, hard-edged shape that he used to limit the sky, frame his figures, and contrast the glowing white Cajuns with the black, dominant landscape— sometimes revealing heart-shapes amidst the branches and moss. 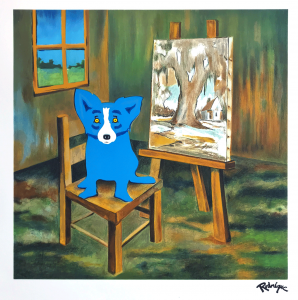 As both a symbol and artistic element, the Rodrigue Oak is as distinctive, contemporary, and enduring as his Blue Dog. Rodrigue’s Heartland spans forty-five years, including landscapes, paintings of Cajun culture, and Blue Dog canvases that revisit and reinterpret Rodrigue’s early landscape style. A series of bronzes includes a 1980 clay relief, as well as an installation of waxes and rubber molds illustrating the medium, and a new collection of Rodrigue Oak jewelry designs. The late series Swamp Dogs (2011-2013) includes three previously unreleased large-scale works on metal.